Professor KIM Sung-Hoon of the Graduate School of Convergence Science and Technology has developed a new substance which prevents the metastasis of cancer. 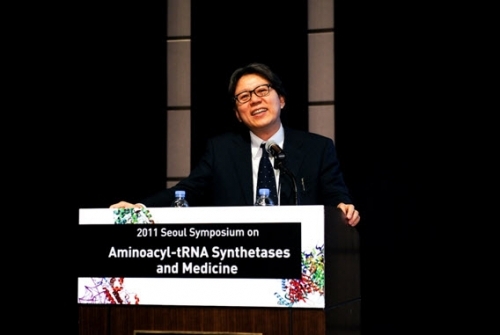 Last year, Professor Kim’s research team discovered that cancer cells create KRS enzymes which combine with laminin receptors and accelerate the metastasis of cancer cells. The new material modifies the structure of the KRS enzymes so that they will not be able to combine with laminin receptors. The details of this study have been published in the online November 11 edition of Nature Chemical Biology.